 Since I'm essentially reviewing three figures in one review, I'm going to try to keep things brief. While I'm still looking at one one figure at a time, there are some things that apply to all of the figures. I'll say overall that the articulation is great, the paint is neat and clean, and there are no quality control issues. Hasbro usually does a good job with their G.I. Joe stuff and there excellent work shows once again here. Each figure has ball jointed ankles, double hinged knees, ball jointed hips, ball jointed abdomen, ball jointed shoulders, ball jointed elbows, ball jointed wrists, and a ball jointed head. These guys are so amazingly fun and expressive to pose and photograph. You really have to have one in hand to fully appreciate them. "Please don't urinate, please don't urinate..."
Airborne made his first appearance in the G.I. Joe line in 1983. 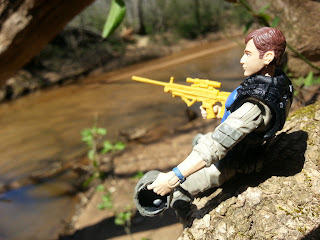 While this figure looks quite different from the original figure (and certainly more technologically advanced) it does retain the same tan and blue color scheme of the original Airborne. Airborne is interesting in that his sculpt is all new. Both his body and his head were intended to come with other figures which were canceled (the body was intended for the Data Viper and the head was intended as an alternate head for the Renegades Law) which is always exciting. He The jumpsuit is great and fitting for a HALO jumper. He has some harness straps around his waist and lower legs that are removable. Of course, his look is truly completed when you put on the extremely detailed parachute gear (once solid piece that easily slips over the figure) and the HALO helmet with attached oxygen tank. It's a great, bulky look that easily strips down to prepare Airborne for action. The two pieces are reused (the parachute setup from the 25th anniv. Paraviper and the helmet from the Renegades Ripcord) but have enough new detailing and coloring that you won't mind. Besides, shouldn't military gear have some uniformity? For getting down and dirty in combat, Airborne comes with a very cool compact AK styled rifle and a combat shotgun, both of which were also included with the Renegades Law figure. 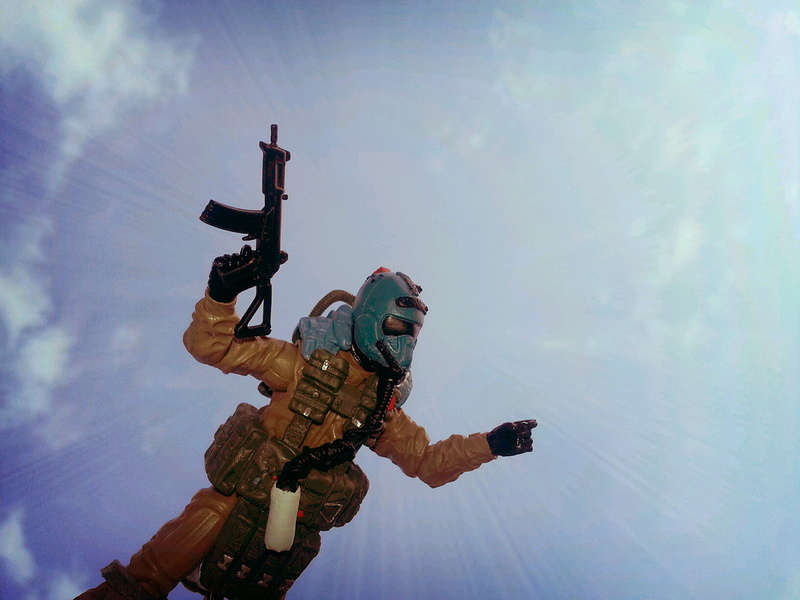 I think looking at the pictures I took proves how awesome Airborne looks with these weapons. Airborne was one of my favorite 25th anniv. figures and he also seems to be one of the best Retaliation figures so far. While he doesn't appear in the movie at all, I'm really glad that Hasbro elected to use him in this set. "This isn't so bad. It's pretty peaceful out here, really." Agent Mouse is a new character who does appear in the film "G.I. Joe: Retaliation." Played by Joseph Mazzello, Mouse functions as an expert marksman for the Joe team. When I went to by this set, Mouse was probably the primarily selling factor for me. Not only was he a new figure with a unique head sculpt but due to his light body armor, kneepads, and the lightweight helmet that looks closer to a bicycle helmet rather than the traditional military helmet Mouse looks somewhat like a Delta force operator. His outfit is nicely detailed; elements like his kneepads and the reinforced material around his knees, rolled up sleeves, breathable material under the arms, and cargo pockets certainly give the appearance of a very functional military outfit. It seems to be largely reused by the G.I. Joe Trooper from Retaliation, which is fine. That was easily the best figure of last year. 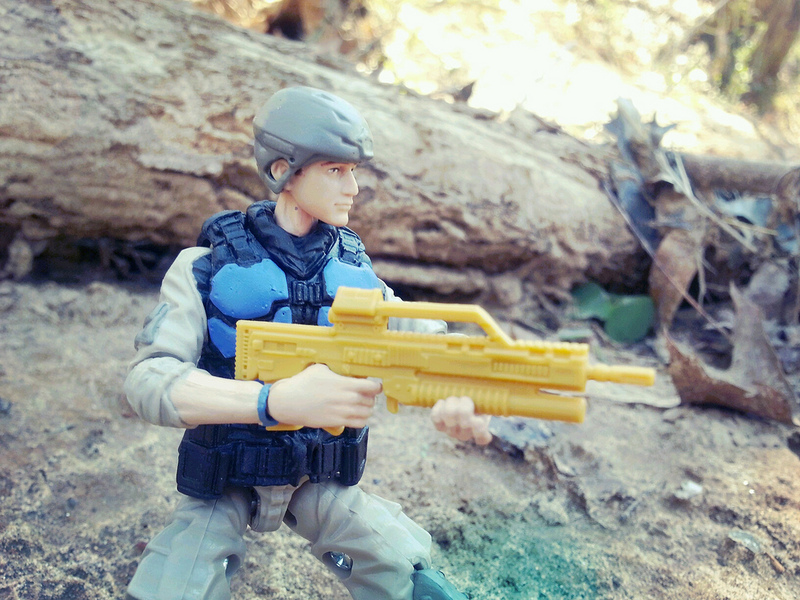 The black and blue body armor looks excellent on him and features lots of cool details like extra clips, a walkie talkie, and a sheathe with a removable knife. The head sculpt is great and seems to nicely capture Mazzello's likeness. Tim Murphy went on to become the best darn tree climber there ever was. Besides the already mentioned knife and vest, Mouse comes with a helmet, two rifles, and a rappelling unit of some kind. The helmet fits tightly and is well proportioned. It looks very modern and fitting for a special forces operator. The rifles are both nice (they're reused from the G.I. Joe trooper, also) and are cast in a yellowish plastic. While I would rather something a bit darker, perhaps Hasbro was attempting to capture the look of rifles that have a desert camo pattern to them? One rifle looks to me like a Kel-Tec RFB with an under slung grenade launcher while the other is bullpup styled sniper rifle, perhaps based off of the DTA SRS. With a little finagling, Mouse can hold his rifles with both hands. The rappelling device is kind of interesting. It's a orange harness on a cord that snaps on the figures back which swings from a large silver piece. The silver piece can attach onto the Ghost Hawk II vehicle or can be attached to a table, shelf, or tree limb with a small clamp. It's neat, and far better than the firing grappling hooks that come with other figures, but nothing to write home about for most collectors. "C'mon team! I'll cover you. Get to the chopper!....Wait, why are you all laughing?" Snake Eyes agrees that it feels good to be a gangster. 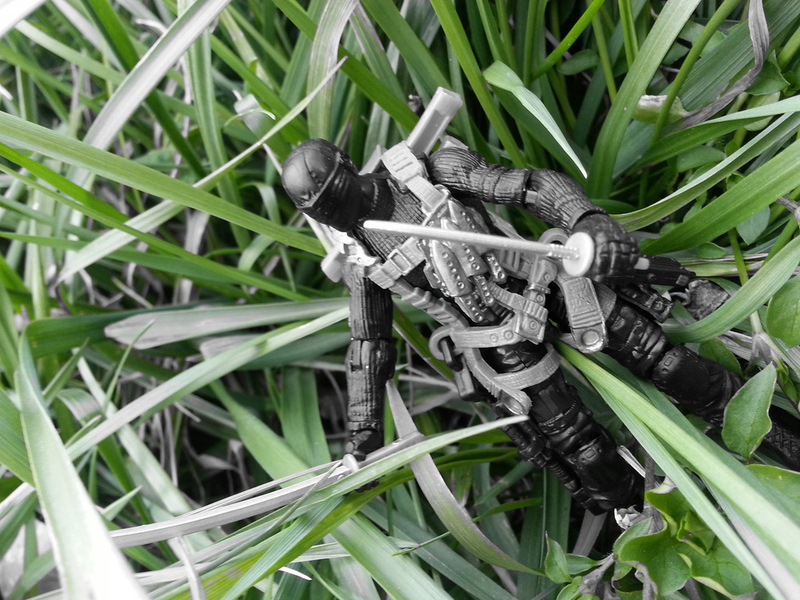 There have been more versions of Snake Eyes released than any other Joe character. 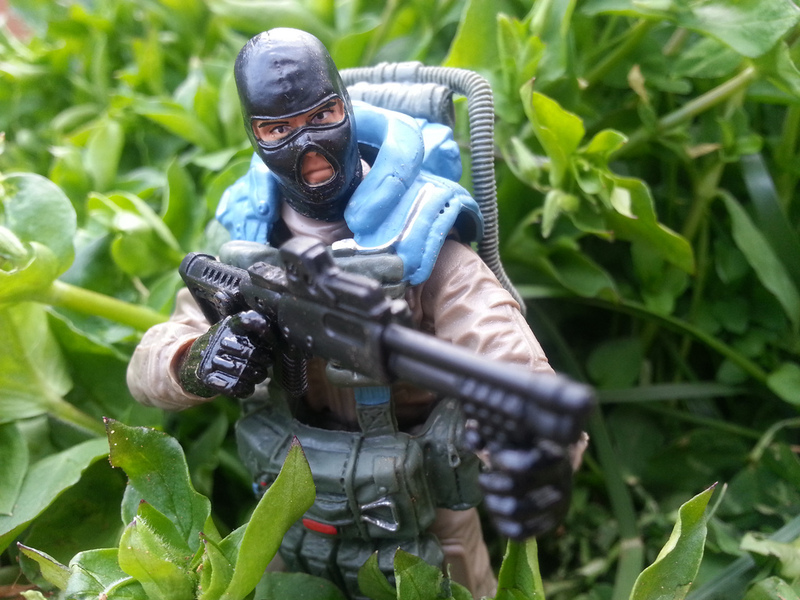 While lots of Joe fans get tired of the same characters being released over and over, such as Duke and Cobra Commander, Snake Eyes doesn't bother me as much. 1.) Hasbro typically manages to bring something new to the table with each Snake Eyes release and 2.) 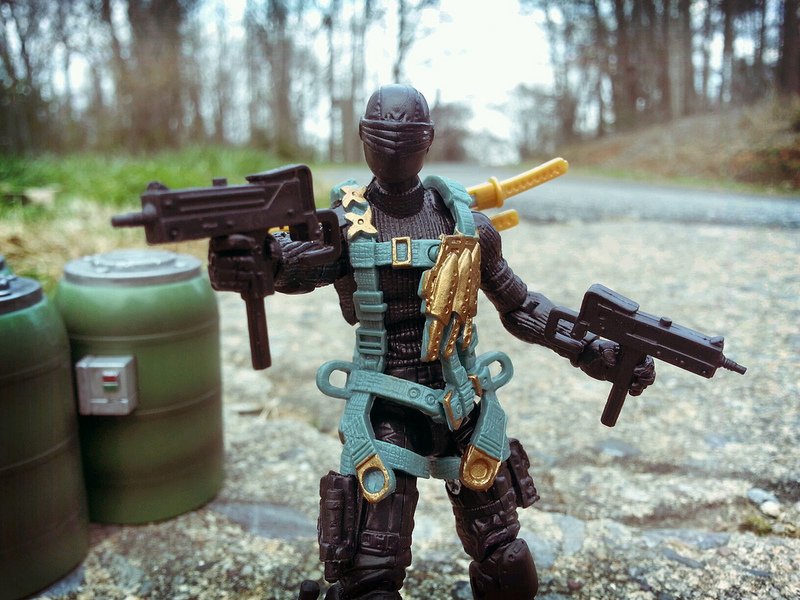 Most Snake Eyes figures are dressed in really nice black ops styled outfits so that a simple head swap makes a really cool character. 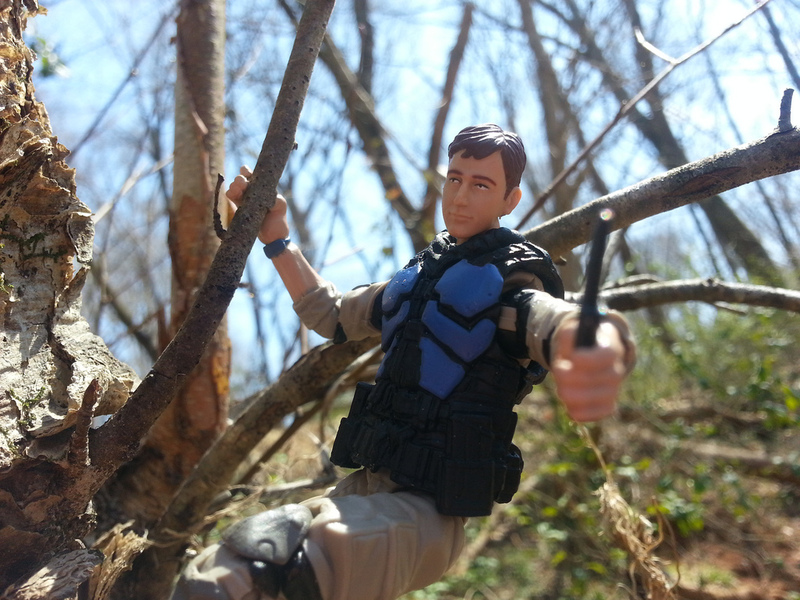 Nearly any figure's head would look good on a Snake Eyes body. 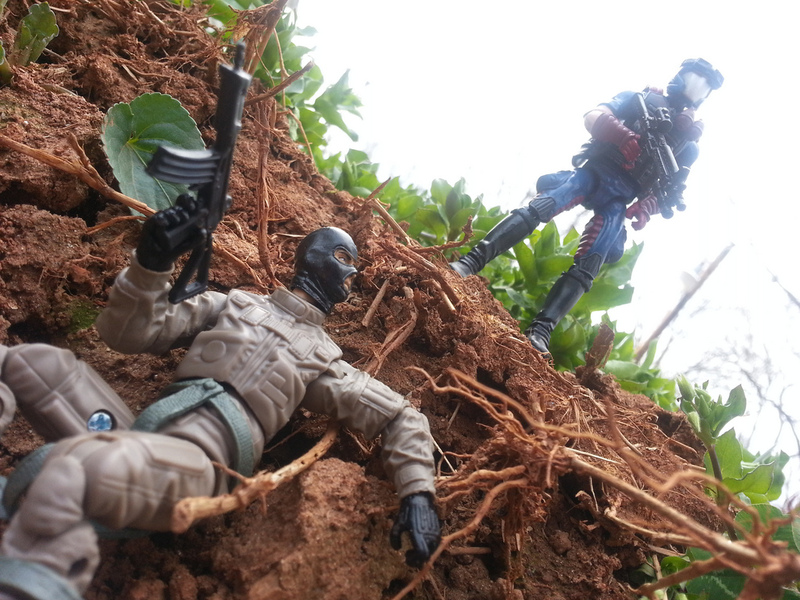 Still, sometimes you get a Snake Eyes figure that's just sort of thrown together. That's this guy right here. Of course, the body used is perfect. 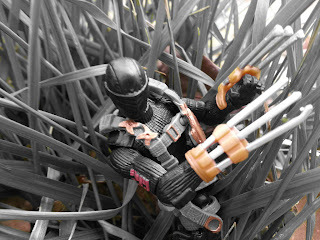 It's the body from the excellent POC Snake Eyes that features the amazing commando outfit of the original along with cool features like the sheathe and holster on his right leg. In case you missed it the first time around, Snakes comes with a knife that fits in that sheathe and a pistol with a removable silencer that both fit in the holster (there's a separate slot for the silencer). All that's fine. It's the web gear that's the problem. This web gear was originally intended to go with the POC Jungle Assault Storm Shadow but that figure never saw an official release. It's really nice web gear featuring straps around his hips, clips to hang the included Mac-11s, two non-removable throwing stars mounted on the right shoulder strap, and a series of three sheathed knives (also non removable) on his chest. It'd be a great piece, except the web gear is a weird bluish green and the buckles and details are gold. It really, really looks bad on Snake Eyes. Had this been a darker green or even a darker blue, it would have been excellent. Instead, it looks horribly mismatched. Also, the only way to remove this piece is to take the figure apart as there are no clips on the leg straps. This picture was taken with a filter, so the colors are not true to the figure. They look better though, eh? I've mentioned the really nice pistol and silencer, knife, and Mac-11a that come with the figure. They are all molded in black and are excellent commando equipment for Snake Eyes. The other included weapons are some large spiked handheld weapons, two gold and silver claws, a bluish green backpack with attached sheathes, and two two gold and silver swords. Once again, the gold and bluish green of these accessories just looks really bad with Snake Eyes. There's a great figure here if you're willing to take the figure apart and replace the web gear with something else, but you'll have to work for it. As it is, this is easily the most disappointing part of this set. Who has claws and more action figures in his likeness than anyone else? This guy! Left to Right: Sgt. Airborne, Agent Mouse, and Snake Eyes. Overall, I'm rating this set as Great. 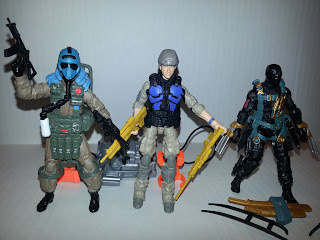 While Snake Eyes' web gear is an eyesore and the name Tactical Ninja Team is silly (only Snake Eyes is a ninja) all the figures are solid and Sgt. Airborne and Mouse are some of the best figures released in the past two years. While the basic Joe figures are selling for around $10, I managed to pick this set up for $20 and typically see it selling for around $24, which means it is actually a multi pack that gives you a bit of a deal. As mentioned above, this set is only the second Retaliation product I've bought so far (I bought the G.I. Joe Trooper last year) but it's one I'm happy to add to my collection. Other than the lack of stands, it manages to avoid the pitfalls of most of the figures plaguing the Retaliation line. Confirmed: Great. Barbecue17 was once part of a tactical ninja team. He'd tell you about it, but then he'd never shut up. That's how awesome it was. You're better off looking at his action figure and toy pictures on his Flickr account.